You are a Scorpio if you were born between October 23rd and November 21st. The Scorpio man personality is anything but delicate. He needs his independence more than most of the other zodiac signs do. 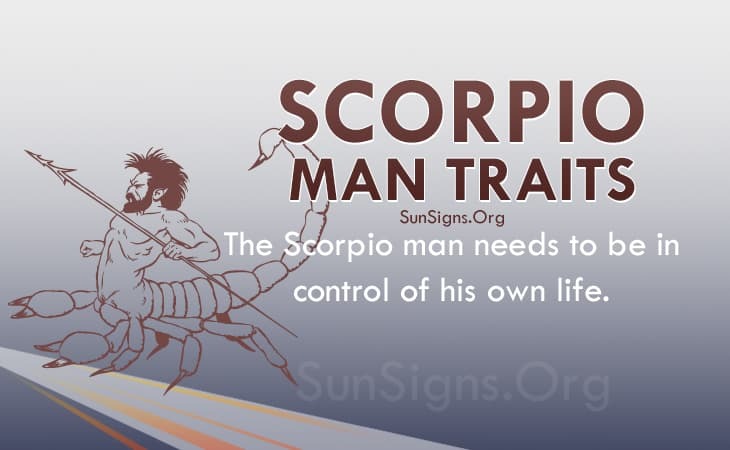 The Scorpio man traits show that he needs to be in control of his own life. He won’t like it when others try to get in the way of this. He isn’t one who likes listening to others or taking orders. The Scorpio man would rather be in charge and giving the orders. The Scorpio male is always on the look out for new opportunities to lead him to better places, or to help him accomplish his large goal faster. This can sometimes side-track the Scorpio man, but never for long. Even if he takes a few side-missions, he will never be truly distracted from his main adventure of accomplishing his life’s goal. The Scorpio guy wants to reach high places in his lifetime, and he will do whatever it takes to accomplish his goals. The Scorpio man personality traits show his stubbornness helps to fuel his determination and concentration on his goals. He may have a goal from when he was young that he is still working on in his old age. The Scorpio men won’t let their dreams die. He would rather work towards them until he dies than admit that he quit trying to accomplish them. The Scorpio man is extremely ambitious, so no one should expect his goals to be minor. The Scorpio characteristics show he doesn’t lay out all the stepping stones to his large goal. He only picks his big-picture goal and works on it at once, instead of making a multi-step plan as to how he is to get there. It doesn’t matter how he accomplishes his goal, so long as he does accomplish it. The Scorpio man traits shows he tends to ignore the minor details in life. He cares more for the big picture, rather than what helps to make it. The Scorpio man tends to ignore things that don’t interest him, although Scorpio is one of the more curious star signs. While the Scorpio man personality will want to learn all that he can about something that he is interested in, he may still tend to be narrow-minded about what he learns. He is stubborn in what he knows, and he will stick to his beliefs even if he is proven wrong. The Scorpio man personality traits show he likes to look at things as good or bad; there is little grey area in the Scorpio man’s life. For the Scorpio male, everything must fit into a category; there is no in-between for anything. The other sun signs may see Scorpio as being narrow-minded because of this zodiac personality trait. It is not easy to make friends with the Scorpio man. While he is social, he doesn’t like to let people know more than they need to about him. He keeps his secrets guarded, only telling the most trusted of his friends. The Scorpio man characteristics show he will want to keep a high-profile, and he will want to hide any and all of his flaws from his peers and the general public. Because of this, people who do not know him well may think that he is perfect, although even Scorpio men have flaws of their own. The Scorpio man characteristics show he may seem tough on the inside, but he is more likely to play it relaxed and sensitively around his partner. Partners are usually first attracted to his tough exterior, but later they fall for the softness of what he is really like on the inside. The Scorpio man zodiac traits show he will want more power in the relationship, however. He will want his partner to still see him as powerful. He is more likely to please his partner in the bedroom because of this. He wants to keep his ego high, and this is a way that both partners will enjoy. Once a Scorpio man falls in love with his partner he will be more gentle and caring around them. This can lead to an overall loving relationship.